Jayapura - BPJS Manpower Jayapura undertakes to apply Pick Me Up Service policy or pick up participants who have work accident. Adventus Edison, Head of Branch Office BPJS Employment Jayapura, explains that experienced by Fitri included in the category of work accidents. "It was a work accident, although Bbak Fitri BPJS Health officer, but we still have to bear all the medical expenses until healed," said Adventus, told reporters through press release on Monday (07/16/2010). 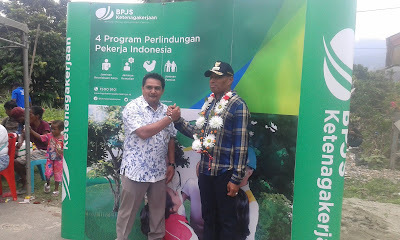 Adventus explained BPJS Employment also wants to give more value from the service that is by picking up the JKK patient directly from Sentani Airport and delivered directly to the Hospital Accident Service Center, Bhayangkara Hospital, to get treatment. "Because of the accidental referral hospital in Jayapura, we are obliged to provide the best service for the participants," he said. Fitri Febrianti (22), an employee of BPJS Kesehatan Kabupaten Nabire, suffered a work accident that was hit by a rider who was affected by alcohol when leaving from his house to the office on Monday (9/7/2018). "The man was riding his motorcycle and immediately hit me, after that I've ga suddenly already in the hospital aja," said Fitri. In that incident, Fitri suffered broken right hand bone, tear wound of right hand, and leg injury required to be referred to hospital having orthopedic expert in Jayapura City. Meanwhile, Ratna Palabiran, Head of Financial Verifier with Bhayangkara Hospital Insurance Implementer, revealed about one year in collaboration as PLKK BPJS Jayapura Employment, there are about 20 cases of work accidents and all handled very well.